There are several airports near Siesta Key, so we suggest you check the rates from your departure city. The closest airport is SRQ. 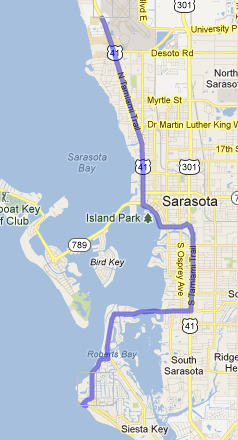 How do I get to Siesta Key from SRQ airport? Driving directions to BeachPoint Cottages 125 Beach Road, Siesta Key, Sarasota, FL from Sarasota-Bradenton International Airport using the North Bridge onto Siesta Key. 1. Head southeast on U.S. 41 S/N Tamiami Trail (toward Seagate Dr) and follow U.S. 41 S for 7.1 mi. 2. Turn right onto Siesta Drive and go 1.6 mi. 3. Continue onto Higel Avenue for 1.0 mi. 4. Turn right onto Ocean Boulevard and travel 1.0 mi. 5. Turn right onto Columbus Boulevard and drive 0.2 mi. How does Siesta Key look from a drone? How do I get to Siesta Key from I-75? Driving directions to BeachPoint Cottages 125 Beach Road, Siesta Key, Sarasota, FL from Interstate 75 using the Sorth Bridge onto Siesta Key Exit: FL-72 W/Clark Rd. 1. Exit I-75 and head west on FL-72 W/Clark Rd toward Catamaran Dr – Continue to follow FL-72 W for 5.8 mi. You will cross over the South Bridge onto Siesta Key and dead end into Midnight Pass Road. 2. Turn right onto Midnight Pass Road and travel 1.3 mi. to the traffic light. 3. Go 1.3 mi. on Beach Road (Midnight Pass angles off to the right). You will reach a fork in the road (Beach Road to the left, Ocean Boulevard to the right) and BeachPoint Cottages will be on the right. See walking directions and the BeachPoint Cottage location by Siesta Village.